For those collectors, I know I can't afford these, but I was looking for a description of Theodore Edward Bear today and found this website, maybe some of you will find helpful perhaps? The Coelura San Francisco: Underwood-Miller Publishers. 1983 First edition. One of 250 copies, bound in dark green cloth with gold foil lettering stamped on the spine. ALL 250 copies SIGNED by the author, ANNE McCAFFREY, and by the artist, KEVIN EUGENE JOHNSON, on a tipped in page preceding the half-title page. Fine (our highest grade) in fine dust jacket and fine publisher's shrink-wrap. Damia's Children New York: G. P. Putnam. 1993 First edition, limited, signed, and numbered state. SIGNED by ANNE MCCAFFREY. Sequel to DAMIA. Volume three in the quadrilogy. Book is bound in dark purple cloth in matching dark purple cloth slipcase. Gilt lettering on spine of book. Book is fine (not issued in dust jacket) in fine slipcase and fine publisher's shrink-wrap. Dragonflight New York: Walker and Company. 1969 First hardcover edition. Fine in fine dust jacket. Dragonquest London: Rapp & Whiting / Andre Deutsch. 1973 First hardcover edition. SIGNED and inscribed: "To _____ [signed] Anne McCaffrey," on title page. Dust jacket was price-clipped by publisher and a new price label placed on front flap, this label then partially removed, light foxing to top edge of book otherwise fine (our highest grade) in fine dust jacket. The Girl Who Heard Dragons No place: Cheap Street. 1985 Hardbound uncorrected prooof for first edition. LIMITED TO ONLY 7 COPIES. SIGNED on title-page by author. Bound in brown cloth with paper label on front cover, no lettering on spine. Measures 6 1/4 x 11 5/8 inches. Label shows some rubbing otherwise fine (our highest grade). Not issued in dust jacket. Not listed in Hargreaves. Habit Is an Old Horse Seattle: Dryad Press. 1986 First edition, wrappers state. Only 342 copies of this state printed. Very near fine. This state not issued in dust jacket. Lyon's Pride New York: G.P. Putnam's and Sons. 1994 First Edition, limited state. Limited to 80 signed and numbered copies. Fine in slipcase. Not issued in dust jacket. Pegasus in Space New York: Ballantine Publishing Group. 2000 AUTHORIAL BINDING STATE, employing the sheets from the first American trade edition. Limited to ONLY 9 lettered and SIGNED copies. Following in the footsteps of authors like Lewis Carroll, Anne McCaffery is now doing a handful of copies of her books in authorial presentation binding. Pegasus in Space has had nine copies bound by Antiquarian Nookcrafts in Dublin in blue leather with gilt lettering and stamping on spine, five raised bands, front cover panels in gilt with top edge gilt, fine marbled endpapers, and lettered and signed limitation pages. Fine (this state not issued in dust jacket). Fine is our highest grade. Ring of Fear London: Millington. 1979 hardcover. Very Near Fine/Very Near Fine. First hardcover edition. Dust jacket illustration by Paul Redway and Leonie Finlay. Murder mystery and romance among the breeders and trainers of show horses. Traces of white rubbing to edges of dust jacket otherwise fine in fine dust jacket. (Fine is our highest grade.) Dust jacket in clear archival-quality jacket protector. The Skies of Pern New York: Ballantine Publishing Group. 2001 AUTORIAL BINDING STATE, employing the sheets from the first American trade edition. Limited to ONLY 20 NUMBERED AND SIGNED copies. Following in the footsteps of authors like Lewis Carroll, Anne McCaffrey is now doing a handful of copies of her books in authorial presentation binding. THE SKIES OF PERN has had twenty copies bound by Antiquarian Nookcrafts in Dublin in blue leather with black leather lettering plates on spine, with gilt lettering and stamping on spine, five raised bands on spine, front cover has Celtic dragon designs stamped in gilt, all edges gilt, fine marbled endpapers, and numbered and bound in signed and numbered limitation page. Fine (our highest grade). This state not issued in dust jacket. The Smallest Dragon Boy Kilquade: Dragonhold Limited. 1982 Glossy Pictorial Wrappers. Very Near Fine/Not Issued in Dust Jacket. First separate edition, limited, signed, and numbered. Limited to only 200 copies, published by Anne McCaffrey herself. Wrappers, 12 pages. Two tiny mars to upper portion of front cover otherwise fine (our highest grade) in fine portfolio. Not issued in dust jacket. The Year of the Lucy San Francisco: Brandywyne. 1986. Brandywyne is a sister press of Underwood-Miller. First edition, PRESENTATION BINDING STATE. Hargreaves says of this presentation state, "18 copies, unsigned. Bound in full green leatherette cloth (simulated leather) with silver lettering stamped on the spine. Bound at the author's request for special copies to give to friends. Issued without a dust jacket. Issued in a gray seude-cloth covered slipcase." Gray slipcase has a line of rubbing on one board otherwise fine (our highest grade) in fine slipcase. Unread. Cooking Out of This World Newark: Wildside Press, 1992. First hardcover edition, leatherbound, signed and lettered. This SIGNED and LETTERED STATE IS SIGNED by ANNE MCCAFFREY and limited to ONLY 26 leatherbound copies. Bound in dark brown leather with gilt lettering on the spine and gilt lettering and drawing on the front cover. This is copy "P." This state not issued in dust jacket. Fine (our highest grade). Re: Wow, check these out! I guess now would be a great time to win the Lottery! Great find! I would love to have those books! "Tia studied Ted carefully. Moira was right; he was a sober little bear, with a very studious expression, as if he was listening very hard to whatever was being said. His bright blue coloration in no way contradicted the seriousness of his face, nor did the frivolous little red shirt he was wearing with the blue and yellow Courier Service circle-and-lightning-bolt on the front." This bookseller is where I found out about the Pegasus in Space Easton press. They list thru ABE so it's easy to keep an eye on things. But... always nice to see him! I only remember Hans because I searched it this morning Sorry for posting something you already know about, but I hadn't seen any of them mentioned here so thought I'd post them up. Awww, so cute Jax! Cuter than the 'real' Ted E Bear, whom I am still hoping to get someday if I can convice my hubby to let me spend so much! You don't need to be sorry silly. In fact I thought it was YOU who posted about this very same topic first, the teddy especially, and us who reacted (including Cheryl who subsequently told us about trying to lure hubby into the ritual of opening the wallet wide). So I was just confused when I thought you acted as if you were posting something new? Does this come with being a sievehead or were you just pulling my leg? And if she tries to say it was pulling your leg, she's pulling your leg about pulling your leg. Got it? Jax, I love your version of Ted!!! I also like the one on the dust jacket. I'm not so thrilled with the real one, but would LOVE to have him, don't get me wrong! I just re-read the ad for Ted and they've changed it. It used to read that if you purchased him the price would go to Anne's favorite charity, (didn't name the charity tho) and I now see that that's been removed. They've had this bear or several of them for many years. I found this when researching collectibles for the Guide. Good luck with the contest! I love your Ted! He's got that serious expression that is much needed. or should that be more a ? WOW!! 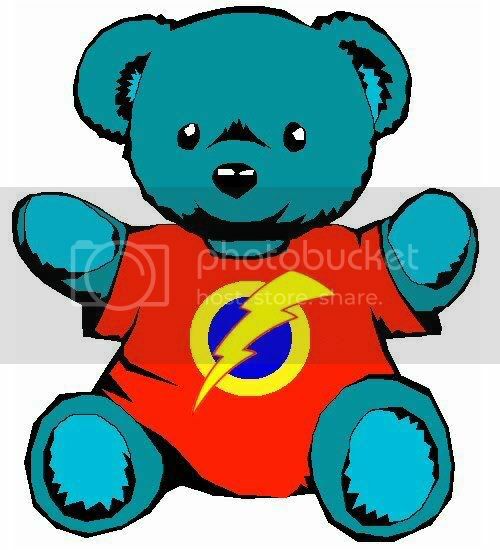 Jax I love the little cute Theodore E. Bear, that you did, it is very close to the real one that they are selling. Someday I might just make one of these for my self out of Crochet. It should do great in the contest !!! Last edited by Lady Maelin; Jun 12 2006 at 12:19 PM. Hmpff... for you collectors: I never saw this for sale (but also never really searched for it), found it in a Dutch second hand books and collectibles shop (online) and I paid something near $ 6,50 for it. Hans, that's so funny! Ya done a good job and it woulda made a super collector highlight! Is there no chance of making it a highlight at some point? P.S. you should do a "Highlight" of this anyways, put it all together like you always do, and then re-issue it. I would love to have you do it that way.......I collect all of the "HIGHLIGHT's" !!! Maelin, it is a picture with a jigsaw effect. To have a real jigsaw you would have to print it, glue it to cardboard or something and cut the pieces out. Thank You Hans, I might just frame it as it is , but I like the idea of the puzzle so, when I make my copy of it I might just make a jigsaw puzzle out of it also. I Just like to say good: Its is one I I loved. With help of some good people Tia did not let her problem stop her. My only question to that is did they find AH1066 E'kay homeworld or not? Oh my.......... ............I have one of these copies I had to run upstairs to the bookshelf and physically touch it and yep.......dark green cloth, gold foil lettering stamped on the spine, dust jacket in shrink wrap, and.............signed by both Anne McCaffrey and Kevin Eugene Johnson ! Thank you Jax for posting this!!!!!! OH WOW Solitary....that is fantastic, what a prize for your collection....PICTURES PLEASE !!! I don't know how many of us have or will ever get to see one of these. So... that must mean he's sold... I wonder where he is now? Has any member here something to confess? Cheryl? Becky? JJ? Nope, not me but I sure wish it was!!! Can you explain to a clueless person, Hans, what Theodore E. Dear is?! Scroll up a little, Cilla. 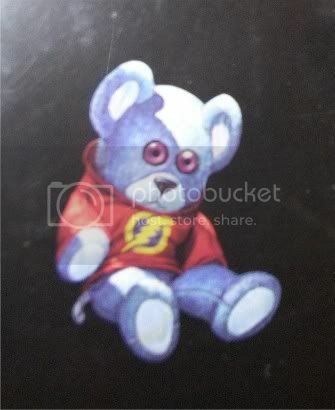 You'll see picture of a blue Teddybear that was made for promotional purposes when the book The Ship Who Searched was published. It is Tia's bear Ted. E. Bear from the actual story. It was for sale at Barry Levin's collectible SF book and memorabilia shop for $450 but it isn't listed anymore which should mean it is sold! Someone else bought Ted E? *sniff* WHAAAAAAAAAAAAAAAAA! If anyone needs me, I'll be sulking offline.